← I Feel the Earth Move Under My Feet…..
Now This is Worth the Money!!!!! Hey I was just wondering, thinking out loud really. I don’t know, maybe it’s me, maybe I’m bonkers or maybe I’m just turning into a curmudgeon. But I listen to all the blah, blah talk from the desk at the MLB Network and sometimes I laugh out loud! I mean really, aren’t these guys supposed to be “experts”? You know it’s taken me a while to simply accept and live with the fact that former players are the soup de jour when it comes to color guys or commentators or analysts or even the play by-play guys. I understand the perspective they bring, I do, honest I do. And I like the fact that the MLB has a pretty decent mix of former players and broadcasting professionals (you remember them don’t you?). But good God listening to virtually every one of these guys (thanks Mitch Williams) gush about what a huge deal the Dodgers made with the Red Sox. What a lineup they will feature, how great this will make them yada, yada, yada! It makes me scratch my head! Simple question, if you had a baseball team and were looking to invest a quarter of a billion dollars, that’s billion with a B, how would you do it? Would you pay 129,000,000.00 over the next six years for a 31-year-old first baseman? The Dodgers will pay 21.5 million a year to AGone through 2017. Would you pay 32,500,000.00 for the next two years to a 32-year-old pitcher who has spent the better part of the 2012 season getting his clock cleaned and a good portion of the last three season nursing various and sundry ailments to his back and shoulder, (oh yea, his pitching shoulder)? Oh and by the way Beckett made his debut last night in Dodger Blue and he was well, Beckett. He served up a homer to the first batter he faced, gave up three runs in 5 2/3rds and took the loss. 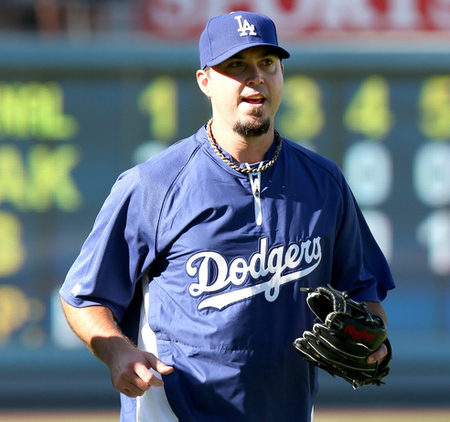 Josh Beckett will receive $15,750,000.00 per year through 2014. And then would you cap off your shopping spree with an outfielder of enormous athletic talent who two days before underwent a surgical procedure that takes at least a year (maybe less for an outfielder) from which to recover? Carl Crawford is owed $102,500,000.00 through 2017. I’m not really sure about such things but then again I’m not a baseball executive or even an analyst, or TV commentater and nowhere near an expert. I’m just a guy who’s been watching and loving this game since Ted Williams was playing left field for the Red Sox! 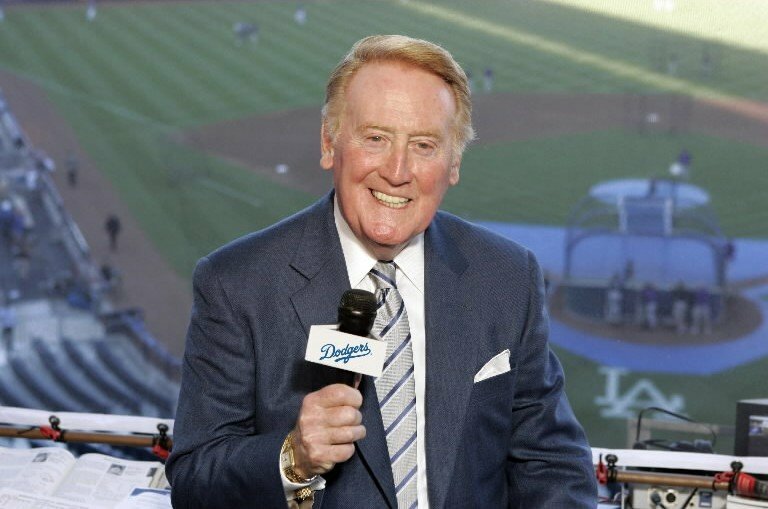 Excited by the Dodgers spending spree, Vince Skully announced he will return to the booth next year to announce Dodger games. will be back! And that my friends is worth a billion dollars of Dodger money! So I guess they made out after all! And so it is on this day in Fenway Park history, August 28,2012. This entry was posted in Fenway Park Baseball, Fenway Park Other and tagged Adrian Gonzalez, Blockbuster trade, Carl Crawford, Fenway Park, Josh Beckett, Red Sox, Red Sox Dodgers Trade, Vince Skully. Bookmark the permalink. 1 Response to Now This is Worth the Money!!!!! I’m not upset about losing those over paid under achieving players, but I would have like to receive more than a low end first baseman with no power, a utility infielder who was given every opportunity to start but has never done it; a 23 year old right handed pitcher who is damaged goods and a bad attitude. An outfielder from Smithfield, NC with some pop, who has not shown he can hit big league pitching. The other right handed pitcher (also from NC) has had only moderate success at the A and Double A levels and if he reaches his full potential has a chance to become a Bob Stanley.